It has taken me a while to adjust to Life Without Dobby, but after 5 months, I can finally look at some photos and videos and find joy in the memories. Last year he endured the snow, but the cold was very hard on his arthritic paw. During our first big freeze early in December, I was actually comforted knowing he would not have another winter. These are random photos from older blog posts. If you click on the photo, I think it will lead you to the original post. Look at the fine print under the image ID and you will see the name of the original post. It’s clickable. Hit and run. The frou-frou flowers I put into that little pot last forever these days. Back then, I gave up and planted lettuce for him. Next year, I will work on some blog posts with “new” photos and there is a backlog of videos, too. He had a very suitable mud hole in the back yard, but he preferred the front yard “black lagoon.” He never gave up trying to get in the front door. My inspiration for stories is not yet up to speed. 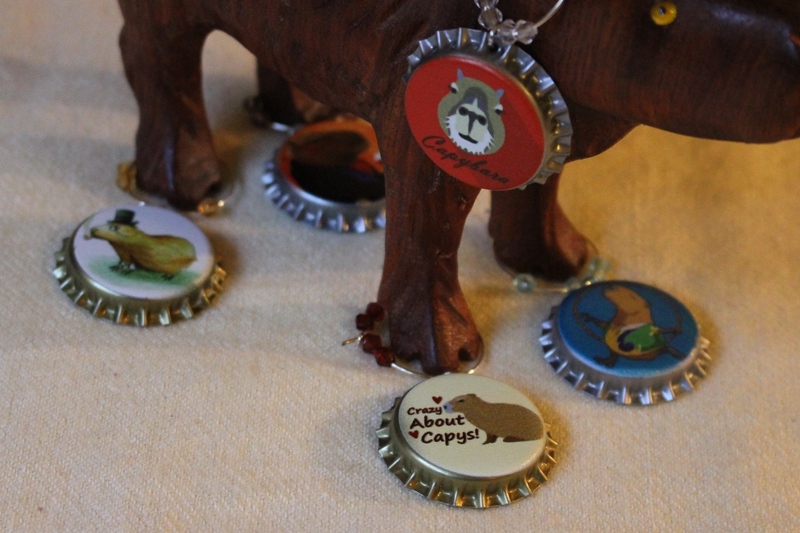 I would love to answer your questions or clear up any confusion you might have about the mechanics of capybara ownership. Please don’t hesitate to ask questions. This is why he wasn’t allowed in the front door. He was very territorial and would “mark” his areas thoroughly. He slept outdoors (unless the weather was freezing.) His pen had a bed with a heated kennel pad, blankets, a wall heater, and curtains to keep the rain out. He preferred the outdoors and came into the kitchen for snacks or sometimes just to say hello. He didn’t drag the blankets off his bed on purpose. He wrapped himself up in them every night, and they gradually fell off as he got up out of bed. Dobby loved to be brushed. I wonder how many hours we sat like this. I couldn’t have managed without The Bartender. Capybaras are challenging pets, and if you want one as engaging as Dobby, you must spoil them rotten. Wild animals seem to have much more “ego” than domestics, and if they don’t get their way, there is hell to pay. The Bartender discusses the merits of Swimming Pool #7 with Dobby. According to the internet, capybaras are chill: they get along with all other animals. Not true. Dobby gives Kitty Hawk a run for his money. Capybaras are very fast runners. The ducks and geese were wary, but he never chased them. Instead, he would casually wander into the flock and then suddenly do a Doofus Dance! What a sneaky guy! My flock eagerly awaits their turn in the hot tub. How about if I post parts of his book, with photographs? That would be a good way to start, but I would really like to hear your ideas. That’s how the book came about in the first place: you asked for it. Let’s try it again in this blog and see what I come up with.